You're trapped in a terrifying amusement park... can you find the means to escape? It's Hallowe'en, and you're stuck backstage at the local theater, waiting for your friends to raid the wardrobe department for suitable costumes. You might as well look around while you wait. Phantom of the Arcade 2: Shadows, Darkness, and Dread (Susan Arendt and John Moulton; 26-Oct-2009; Z-code 8). 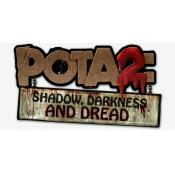 Download POTA2.z8 from The Escapist. Phantom of the Arcade 2: Shadows, Darkness, and Dread - at IFDB. Phantom of the Arcade 2: Shadows, Darkness, and Dread - at ifwizz interactive fiction (in German).